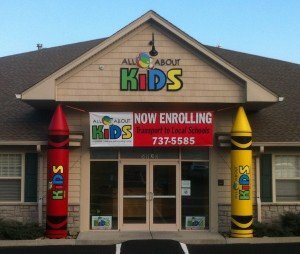 CINCINNATI – December 1, 2011 – All About Kids Childcare and Learning Centers today announced the opening of its eighth location in Fairfield Township, Ohio. The new facility is open for tours and pre-enrollment and will host a Breakfast with Santa on December 3, 2011 at 9:00 a.m. Childcare and classes will officially begin on January 3, 2012 with busing to and from Lakota Local, Fairfield City, Edgewood City and Hamilton City schools. Located on 5290 Reigart Road in Fairfield Township, the new center serves families from Fairfield, Hamilton, Liberty Township, Trenton and surrounding communities. When open, the center will provide early childcare development programs for children from ages six weeks to 12 years old. The center will also employ up to 30 full and part-time staff. All About Kids has hired Andrea Moyer to serve as the director of the new center. Most recently, Moyer served as the co-director and assistant director for All About Kids Montgomery facility and she also worked as a toddler teacher in an early childhood center. Moyer earned a bachelor’s degree in business management from Northern Kentucky University. All About Kids Fairfield provides a tailored, hands-on learning experience that benefits the individual child. The center offers spacious indoor classrooms and outdoor space, as well as WatchMeGrow remote monitoring camera systems for enhanced security. Parents have the ability to look in on their children from any internet connection. All About Kids green philosophy applies to all areas of the business, from the building construction to multiple aspects of student curriculum, which enables All About Kids to help kids understand their role in caring for the environment. To schedule a tour, visit https://www.allaboutkidslc.com/fairfieldtownship/ or call 513-737-5585. While All About Kids Fairfield is a corporate-owned center, the company has identified communities and locations for additional learning centers in Ohio and Kentucky for prospective franchises. All About Kids has plans to add several franchises in 2012. For more information about All About Kids franchises, entrepreneurs should visit https://www.allaboutkidslc.com/franchise/ or call 513-463-0222. Founded by Cincinnati, Ohio natives, Jim and Tracy Kaiser in 2005, All About Kids Childcare and Learning Centers and its franchisees currently operate seven learning centers in Ohio and Kentucky. The company focuses on providing early child care development programs for kids from infants to 12 years old through safe, engaging and green learning environments. All About Kids will soon be the only LEED Certified Green childcare center in the Tri-State area and one of the only ones in the country. In 2008, the company introduced a https://www.allaboutkidslc.com/franchise/franchise model that allows entrepreneurs to own their own All About Kids Learning Center. The company is currently selling franchises in Ohio, Kentucky and Indiana. For more information about All About Kids, visit www.allaboutkidslc.com.